In this Struts 2 tutorial, we will create a login application using Annotation. 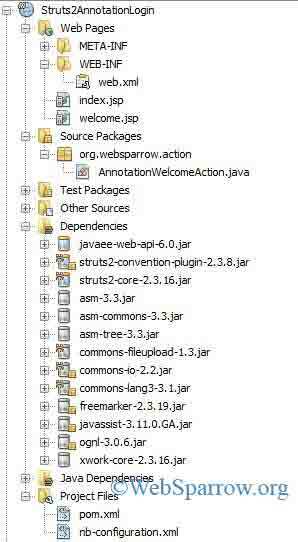 To create an annotation based application you need to include the struts2-convention-plugin-2.x.x.jar in your project. You can directly add all core JARs of struts2.x.x in your application or add below to your pom.xml if your application maven based. Note: If you are using Annotation, you need not to create the struts.xml file. @Namespace: Define the path of action class. @ResultPath: Define the path of the JSP page. @Action:: Define the name of the action that is used in the URL. @Result: Define the JSP page to be displayed. In this class define the name of form variable and generate the getter and setters of variables. And define your business logic. Create your form page and welcome page. Now run your application and login with credentials. Check the below images for reference.